Source: ARTBA analysis of federal Census Bureau data for value of construction work in September 2011-2014, adjusted with the ARTBA Price Index to account for changes in material costs, wages and inflation. The real value of highway and bridge construction work in 2014 continues to be slightly ahead of last year’s pace but is still below pre-recession levels, according to ARTBA analysis of data from the U.S. Census Bureau. 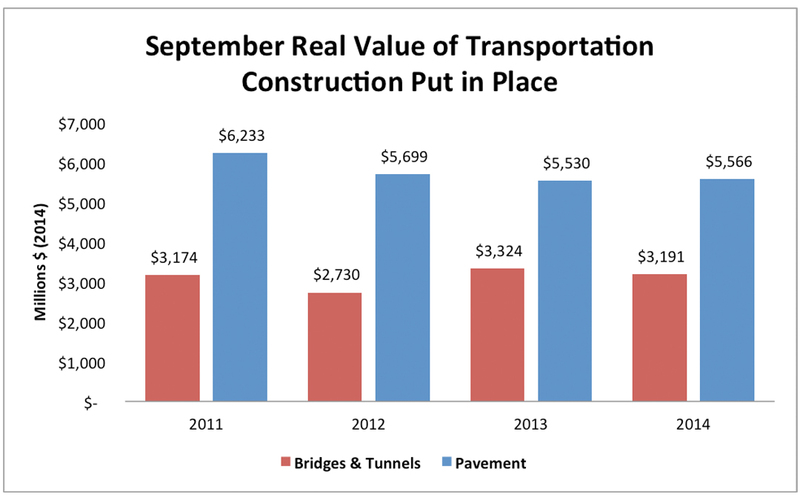 The real value of all highway and bridge work was $8.76 billion in September 2014, compared to $8.85 billion in September 2013, when adjusted for material prices and inflation. Contractors performed $35.3 billion in pavement work between January and September 2014, up 3.4 percent from $34.2 billion during the same time period in 2013. After months of record-setting bridge work, the pace of construction activity has begun to slow down. Contractors completed $22.75 billion in bridge work between January and September, compared with $22.78 billion for the same period in 2013. Year-to-date construction activity is flat across all other modes, including mass transit and airport work. Detailed data by month and mode is available as part of ARTBA’s market subscription reports. For more information, please contact Lital Shair.